Location, location, location is a common term for a successful real estate investment, and if you want a kitchen that works for you successfully, every day, then advance planning for the placement and location of every appliance and category of items is crucial. You’re probably familiar with the triangular arrangement of the sink, oven and refrigerator that keeps them equidistant from each other and prevents unnecessary steps, but are you sure where your dishes, food, prep areas and small appliances should be located? First you need to know the jobs that you want your kitchen to do. Do you have children that need to be able to access snacks and breakfast items? Do you entertain a lot or bake on a regular basis? What about a place to sit and have a cup of coffee and read the paper? Do you have special collections of dishes and glassware? These are just a few categories of items that need to be considered when planning a kitchen that will work for you for years to come. No matter the size of your kitchen, you can ‘zone’ it. Zones can be eating areas, baking areas, prep space, buffet entertaining space, clean up and of course, cooking. If you cook a great deal, cluster your microwave, oven, cooktop, pressure cooker and slow cooker all in one area. Make sure that the pots, pans, casserole dishes, and kitchen tools such as spoons and spatulas are close at hand. A prep zone is usually near a sink, garbage, knives, colanders and paper towels, while person that entertains a great deal will welcome and consistently use a length of countertop that can serve as a buffet while the cupboards and drawers above and below that counter house the good china, serving pieces and linens. Your clean up area has a dishwasher and easy access to a sink and your everyday dishes, cutlery and glasses need to be stored nearby saving you unnecessary steps. The baking zone contains bowls, whisks, measuring cups and spoons along with an oven, oven mitts, baking trays, muffin tins, flour, sugar, etc..
As you can see, specialized activities go more smoothly and quickly when everything you need is within reach or the fewest steps possible. The location of a pantry is best when in proximity to a refrigerator, whose ideal location is near the garage door for easy unloading of groceries. In the pantry, it works best to put all cans on one shelf (usually at elbow height) while light boxes and bags are ideally located above or below the cans. Bottles can go on a lower shelf, while light items such as paper towels and plates can be stored on a top shelf. Be sure to locate snacks at the height of your children so there are no mishaps when they reach for something that could spill or break. A lot of people are incorporating their eating area into an island or countertop rather than a separate table and chairs. Do you want that area to be nearby where you cook, or located nearer to your entertainment zone or a view? Do you want a bar height for guests to drink wine and beer at, or is a lower height friendlier to your smaller children? Another choice that needs consideration if you want to have a successful kitchen is whether to have cupboards, pull-out drawers or a combination of both. Cupboards are ideal for very large items as the shelving is usually adjustable, while pull-out drawers are great for storing whole sets of dishes in one area, or for quickly locating smaller items or quantities of items: e.g. a collection of nothing but different sizes of bowls or a “pot” drawer and a separate “lid” drawer. If all of this sounds complicated, take a piece of paper and note the types of zones that you want in your kitchen. Under each zone, list the kitchen items that you reach for when accomplishing that zone’s work. Next, sketch some cupboards/drawers and a countertop that you feel would be necessary to accommodate those items and you begin to plan the ideal layout. 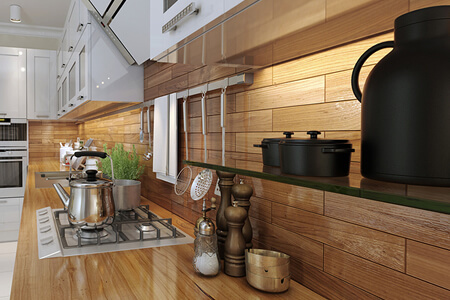 When in doubt, consult a kitchen designer who can help you figure out the best allocation of space and storage for your current and future cooking needs.